This is why I've stopped making custom figures. Intelligence sources indicate that this ninja commando may be a renegade from Storm Shadow's very own clan. It is believed that he created his own sword technique by observing the battle strategies of scorpions and adapting the movement into a backhand sword slash that he calls the "Scorpion Slash." He is an expert with all edged weapons, small handguns and explosives, and is often encountered working with a fellow rogue ninja cohort named Dice. Slice appears to lack the grace usually associated with ninja training, although he has, in the past, demonstrated inexplicable wraith-like vanishing skills. He also makes up for any missing technique with blinding speed, shocking ferocity, and exceptional sword skills. It is the uncanny combination of unpredictability and power that makes him an opponent not to be underestimated. The only reason I bought the GI Joe: Retaliation Ninja Showdown box set was to get the silver mask to put on the Red Ninja so I could make Slice and pair him with Dice. And now here we are, with an official Slice, rendering mine utterly useless. At least the head is a new sculpt, so I don't feel too bad about replacing/upgrading my simple custom. Proving that Hasbro is no more creative than we are, Slice is built on the Red Ninja body. 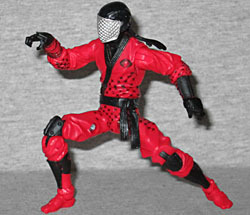 Honestly, the day Hasbro designs a new generic ninja body, Joe fans are going to fall over in surprise. There have been three different Storm Shadows (four if you count T'Gin-Zu), two Red Ninjas, a Dark Ninja, a Kamakura, and Blind Master since it first appeared. It's a nice sculpt, and it's not like all these karate commandos would be wearing drastically different pajamas, but every time it's released, all I can think of is how ragingly difficult it was to find the original figure. 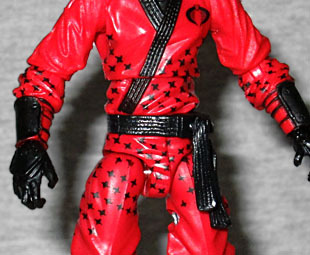 Slice is painted a nice, vibrant red with black accents - including the field of stars all over his midsection. His hood is black too, and his mask is silver. The stuff on his filecard about the "Scorpion Slash" attack move is a reference to the original toy. Part of the "Ninja Force" subset, 1992 Slice had a spring-loaded attack feature: you could wind up his arm and let it go, and the packaging referred to it as his "Scorpion Slash." This figure doesn't have anything like that, thankfully - just all the normal articulation you expect from this mold, which means he's plenty flexible for ninja fun. 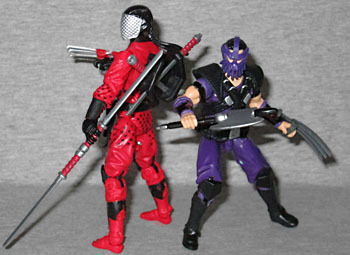 Suiting his rep as a master of all edged weapons, Slice comes with a bunch of them, all reused from various Storm Shadows: two hooked swords from a G2 Valor vs. Venom release; two tekagi-shuko; and a backpack with four swords that was originally seen on the Retaliation "Sneak Attack" Storm Shadow. The swords can be removed from the backpack, and joined together to form a double-bladed weapon. It's actually pretty cool. I was mildly annoyed when Slice was announced for FSS 3.0, since it meant the time and money I'd spent assembling my custom was a total waste. But having this figure in hand, he's definitely better than a "put one accessory on a different toy" effort, and I'm begrudgingly glad they did it.